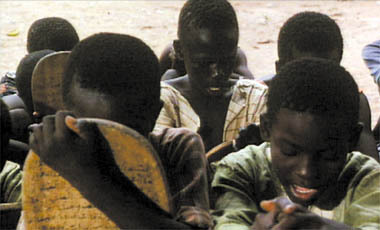 In a Senegalese village, a group of destitute children are gathered in the dirt around a seated priest, reading prayers from their tablets as the priest eats greedily from a bowl of food. One of the children, Madou, eyes the priest suspiciously, and turns his gaze to a bird’s nest perched in a tree above. The priest instructs the children, “Go and beg,” and they disperse. Madou wanders the village with a collection cup, asking for “Charity in the name of God.” One kind woman in the village offers him food. Madou next ventures to the marketplace, where a woman pays him to carry her groceries to her car. As Madou is looking in a storefront window, an apparently handicapped boy, who wears rags and pushes himself along while kneeling on a skateboard, rolls up to the curb and asks Madou for help crossing the street. After Madou has pushed him across, the boy stands up, exposing the artifice of his begging ploy (i.e., he’s not really crippled), and laughs at Madou. He introduces himself as Ablaye and the two boys make fast friends, wandering around together. As they pass a gated establishment – what looks to be a school – a boy in regal attire sits inside the gate, casually chewing food. Madou and Ablaye make eye contact with the boy, before continuing on their way. Next, they play a trick by filling a wallet with money and placing it in a suited man’s path. As the man reaches for the wallet, the boys cry out, “Thief! Thief!,” startling the man into leaving the wallet and moving on. In another scene, the boys watch from a distance as a birdseller sells a man one of his caged birds. Later, the boys exchange their respective stories: Ablaye’s father has lost his herd during a drought, while Madou’s mother has given him to a priest, for whom he must spend his days begging. Ablaye leads Madou to the garbage dump where he and his father live, and gives his father the money he has earned that day from begging. His father gives him permission to “go and play.” As the two boys walk off into the distance, Madou asks Ablaye if they will meet again tomorrow. “Maybe,” Ablaye replies. Madou walks home at night, in the rain. On his homecoming, he gives the priest the money he has earned. He lies down to sleep in the dirt beside the other destitute children. On closing his eyes, he has a dream that he is running freely along a beachfront. He stops at the edge of the shore, kneels, and holds out his arms to fly like a bird. He is replaced by the image of a bird flying upward toward the sky. End short. While this is the “surface” narrative of the short, a second, metaphorical narrative is simultaneously told through the short’s innovative soundtrack. Madou’s sporadic voiceover narration is coupled with narrative lyrics sung by a child’s choir, to present the tale of a bird whose mother has left him alone in the nest, while a crocodile lies in wait down below. The crocodile lies to the bird and tells him that his mother will soon return, in an attempt to lure the bird down from the nest. The bird, however, knows the crocodile is a lying predator, and also knows his mother is not coming back. To further the bird-crocodile symbology, there is bird imagery planted throughout the film. For instance, there is a beautiful composition as Madou first enters the marketplace, where we see him backgrounded against various cages of birds. The bird-seller scene is also quite striking. As the bird-seller reaches into his cage to pull out a bird for the customer, the first bird he pulls out is dead; he gives it no regard, throwing it onto the dirt, as we cut to Madou and Ablaye’s petrified reaction. (Another striking detail of this scene: Madou peers from behind a yellow sheet hanging on a line, while Ablaye, from a red sheet, to Madou’s right, thereby forming the rightmost two colors of the Senegalese flag.) There are also seemingly non-diagetic chirping bird sounds added to the soundtrack in various places, as when Ablaye and Madou exit the marketplace to venture into the desolate territory where Ablaye lives amidst disposable waste. The execution of this animal symbology is masterful throughout, culminating in the final, haunting image of Madou stretching his arms out like a bird by the shoreline. What is distinctly non-American about this short are obviously the settings (a Senegalese village and marketplace), dress (robes, bare feet), and customs (eating without utensils, for instance) on display. On a more narrative level, the incorporation of the secondary, fable-like storyline, is distinct. The use of (especially animal-based) fable is an ancient African narrative tradition that is here synthesized and modernized, resulting in a hybrid narrative form where the secondary and primary storylines talk to one other and add to each other’s punch. The film has an agenda, advancing the cause of impoverished, exploited children in Senegal, but its reliance on metaphor allows it to avoid heavy-handedness, and instead present its subject matter in a subtle, affecting way. All in all, this will probably turn out to be one of my favorite shorts that I’ve seen. The kinship between the two boys is endearing, the film’s narrative structure is exquisite and complex, and its sequences are carefully composed and expertly shot. In sum, this is one of those short films that truly flies. I agree with Jay that some of theses women are placed in a heavenly, motherly light. The filmmaker has clearly distinguished these women giving them a symbolic presence. The woman that gives Madou food (that looks suspiciously like milk) is an overt mother figure. The other woman who oversees the boys playing the wallet trick on the businessman is also noteworthy. Like the milk providing mother, this woman is ornately dressed, a smile adorns her face, and her beauty contrasts the harsh environment and poverty stricken town. This becomes a major theme. Not only does Madou call this lady a thief, but the two boys also trick the businessman into picking up the wallet and call him a thief as well. The message seems clear: these boys are being robbed of opportunity, innocence, a caring mother, etc. If this is to be viewed a national cinema, it presents this country in a harsh light. This is a land of a huge discrepancy between the haves and have nots, of corruption, and of destitute children who fall victim to it all. Also, the bird-seller scene is quite striking, but I also found it technically interesting. After the old man buys a bird from the bird seller and makes a prayer with the bird in order to ward off bad luck, he presumably lets the bird free. However, we never see the bird fly away, instead after the man places the bird to the right of him, we cut to a reaction shot of the two boys following the bird (presumably) with their eyes off to their left. This elementary trick was effective. The "animal symbology" of this film provides a sense of the preternatural, or otherworldly: the birds that escape fly away from the earth; those that do not, like the dead one in the bird seller's cage, fall to it. Madou and Ablaye and the other little orphaned and homeless birds dream, it would seem perpetually, of escape, but the trope of flight suggests abandonment of the world altogether, irremediably populated as it is with its "predatory crocodiles" of both sexes. It is hard to imagine Madou's mother wishing to give him up, but Madou's vague history allows just as much for that possibility as it does for a more redeeming one. The thought that Madou was sold to the priest by his mother and veritably abandoned, makes the words "Lady, thief" that Madou utters at the woman who failed to pay him all the more poignant. I'd like to take Lindell's point regarding cinematography one step further in defense of the idea that the world of Madou and Ablaye offers nothing to hope for but the impossibility of final escape. As the governing trope, the bird suggests flight. But as Lindell points out, the bird from the bird seller only ever presumably flies away; the camera does not follow it. Similarly, in the dream sequence, which concludes the piece, the dove that replaces Madou, though it flies away, simply leaves the frame, which maintains its grounded fixity. Likewise, no single shot of the film shows the sky, and the only upward shot is that of the bird's nest in the opening sequence, from which the symbolic bird will never escape having been abandoned by its mother without ever learning to fly. Madou's flight, then, is only ever in his dreams, and the viewer is left with the sensation that if he never gets off the ground he'll grow up to be a thief, another predatory crocodile.